Eyebrows went up when I told friends I was heading to the Bay Area for a wine conference. A wine conference? Well, yeah, and it was pretty serious at that. Serious juice, serious wine tasting and serious talks by some very serious people. Drinking wine is big fun, but making it – and making a great one – takes serious effort. 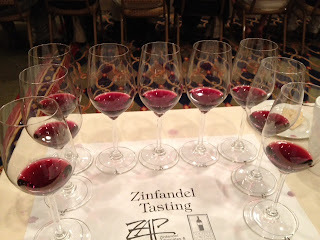 The Society of Wine Educators brought out wines by the hundreds from all over the world for the nearly 350 attendees. The bulk of it ended up in spit buckets, but not before each wine and flight had made its point – whether about terroir, vintage, varietal, blending, ageing, history, winemaker, technique or whatever reason it was poured. Eager as I was to soak up mouthfuls of new wine knowledge, each tasting session also drove home the importance of tasting with the palate, letting each wine speak for itself. In order to do that, I first needed to zap any wine prejudices lurking in my head. Wine prejudice is an obstacle to wine enjoyment that wine educators and sommeliers try to overcome when we introduce new wines to diners and students. You've heard it too: I don't like Chardonnay. I'm a Cab guy. I don't drink pink. I only like Champagne. Italian wines are boring. Life's too short to drink cheap wine. Preformed ideas about a wine or wine style are as varied as the reasons they exist in the first place. Some people swear they simply don't like wine of a certain color or from a certain country, county, producer or grape. Or, like that handsome stranger with twinkling eyes, a wine bottle might seduce with visual cues that can trip up your palate. Cute labels, fetching fonts and logos, sexed up or rugged wine art all aim to trigger a buy response – perhaps with enough power to trump a so-so palate experience. Some wine notions are cemented by a connection to a person or place. Visit Tuscany and shun Sangiovese? Not happening. Perhaps you met the winemaker at a dinner, strolled the vineyards or visited the winery. Chances are you'll recall that wine with fondness. Sure, you might have actually liked the wine, but remember why politicians throw themselves into throngs at election time to shake thousands of hands. Touches convert the undecided into voters, if not ambassadors. With wine, tasting on location is a powerful ritual that can lock in a memory or allegiance. And with that comes the seed for a wine prejudice, albeit with a positive slant. Cost and the status of a wine or region can also play tricks on your wine palate. The status-driven may turn up their noses at lower-priced wines, or fail to imagine inexpensive wines can possibly be very good, no less great. Their minds might be closed to all but expensive or prestige wines. At its extreme, point-chasers who encounter pricey wines they don't find particularly enjoyable may question their own wine palates, or write off disappointing wine experiences to deficiencies in their wine knowledge. And it's not just wine snobs who fall for the allure of a wine bearing a triple-digit price tag. Just knowing the price can prime the palate into the expectation of a glorious wine experience, even before the first sips roll from the glass. Wine instructors and sommeliers are not immune to preconceived wine notions, although professionals work harder to set aside wine prejudices when a new wine presents itself. Novices and wine educators alike can assure a more rewarding tasting experience by greeting a glass with a clean palate and a mind mopped clear of preset ideas about what the wine will or should taste like. In other words, be an undecided voter until the sips are down. So did I think I didn't like Zinfandel? And, when pressed to name a producer or two that I did like, would it be from Napa, Dry Creek Valley or the Central Coast? I thought I knew the answers – until I tasted my way through a flight and the blinders came off at the end. Try it yourself sometime, and be ready for a few surprises. I plan to share more of what I learned and tasted at the Society of Wine Educators conference this season at our Cooking with Class Wine Essentials classes, Food & Wine Pairing Dinners and winemaker dinners. Join us for the fun, Chef Andie's remarkable food and a new season of thrilling wine surprises when we reopen in October.